Several decades ago, scientists conducted some interesting social experiments on the behavior of children. The researchers set up a lab that looked just like a play room. There were all sorts of toys, games and puzzles for kids to use whenever they wanted. The children were led to this room then told they could play with anything while they waited for a researcher to arrive. Little did they know that their actions were being observed and recorded through a one-way mirror. One of the toys in the room was a bobo doll. A bobo doll is an air-filled clown that has a weighted bottom so it always stands upright. When it is bumped, punched, or bopped, the bobo doll falls over but it always pops right back up. Once the kids were alone in the room, a research assistant came into the room to play with some toys for a few moments. In half of the randomly assigned conditions, the research assistant would approach the bobo doll and strike it forcefully while the child watched. Then the research assistant left the room. The entire experiment was set-up to observe what happened next. What would the kids do when left alone after seeing the research assistant pummel the bobo doll? Hundreds of versions of this study have been conducted over the years by varying the ages, genders, and numbers of children in the room, varying genders of the research assistants or varying the types of behavior modeled. This research has even been replicated on adults and animals. No matter the manipulation by the researchers, the same basic finding always emerged. The study participants were much more likely to perform the behavior they observed, especially the behaviors of authority figures such as research assistants, parents, church leaders, teachers, role models, public figures, media personalities, sports figures, and business leaders. This human tendency to copy observed behavior is the basis of the entire advertising industry. If modeling did not work, consumer behavior would be unaffected by any of the words, music or images we see and hear in commercial advertising. Put another way, without the tendency to copy observed behavior, there would be no point to Super Bowl commercials! Can you imagine such a world? But the simple truth is, we are very impressionable and therefore we can be influenced by the world around us including the examples we observe in others, especially the example of those in positions of leadership. Case Study Number One. A few years back, WellSteps worked with Kaiser Permanente to deliver the WellSteps Small Business Solution to dozens of companies. After this program was over, the companies were placed into one of the three groups based on their leadership support: Weak, Moderate, or Strong. We then looked at the percentage of employees who participated and who changed at least one behavior. 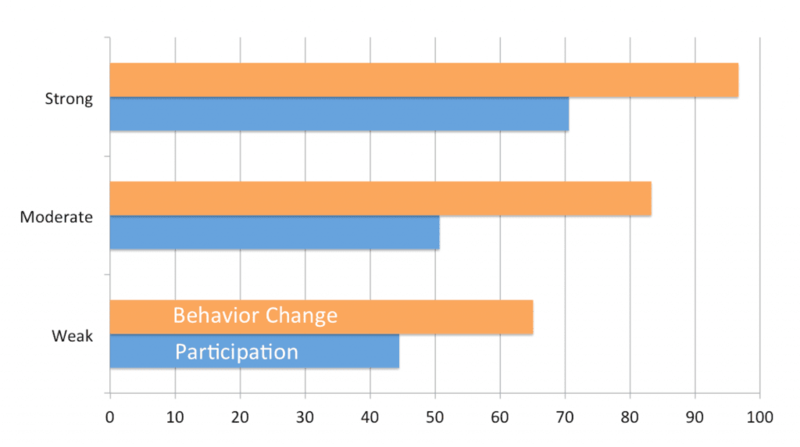 As shown above, companies with stronger leadership support (bars on top) had far greater participation and had more employees who reported changing at least one behavior. This data also shows what is known as a graded response. Though not ideal, moderate leadership was better than weak leadership, suggesting that at least some leadership support is better than none. Strong leadership support is even better. In fact, strong leadership support was worth an additional 25 percentage points in participation and over 30 percentage points in behavior change. The stronger the leadership support, the more the employees participated and changed their behavior. Case Study Number Two. In 2012, the data from 455 companies who voluntarily completed the scorecard from the Health Enhancement Research Organization were evaluated. The full report of this analysis is provided here. In this evaluation, the relationship between supportive leadership and both employee health risks and employee cost was examined. Each company was placed into one of three groups according to their degree of leadership support, from “marginal” to “supportive” to “very supportive.” In like manner, improvement in employee health risk or cost was grouped from “none” to “substantial.” We expected that more companies with very supportive leadership would also report much larger improvements in health risk and/or cost. We also expected the opposite to be true. In other words, among companies with marginally supportive leadership, we anticipated those companies would have poorer results. Here is what we found: the companies with very supportive leadership were 4.2 times more likely to report substantial improvement in employee health risk. They were also 2.5 times more likely to report substantial reduction in medical costs. The companies with marginally supportive leadership, were about 4 times more likely to report no improvement in employee health risk or reduction in medical costs. Case Study Number Three. In this analysis, we compared leadership levels within two WellSteps customers. One company had very strong leadership and environmental/policy support and the other did not. The company with strong leadership support took advantage of all the WellSteps marketing and communication tools, had an engaged, participating senior leader and had an engaged wellness committee. The company with poor leadership support placed the full responsibility for the wellness program success on a member of the HR team. None of the leaders in this group participated in any of the wellness initiatives, the wellness committee was non-existent and there was little recognition given to any employees who were participating. Not surprisingly, the supportive company had participation that was 2.2 times greater and a successful program completion rate that was 4.2 times greater. 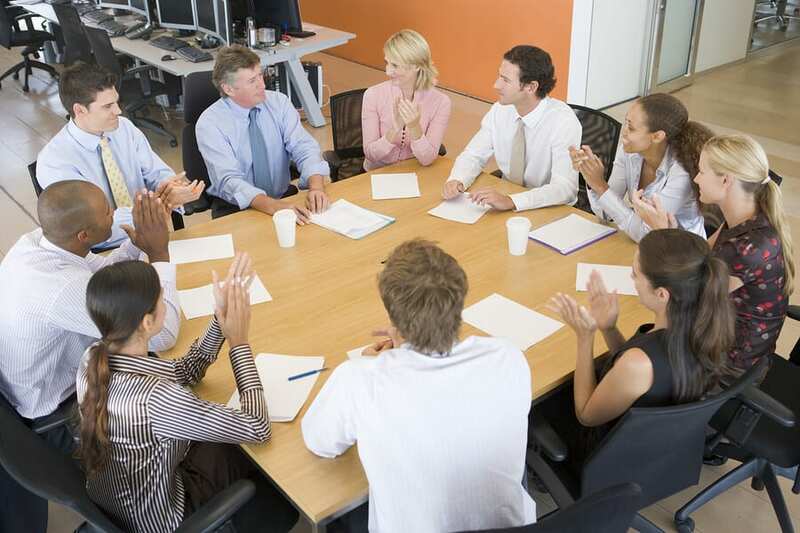 All the employees in this company knew that the company wellness program was important because they saw the senior leaders both participating and encouraging others to participate. The most successful wellness programs are those that have leaders that model program participation that they want to see from employees. In these successful programs, leaders consistently express the importance of employee health and well-being to the organization (through words, actions, and policies) and devote sufficient resources to health promotion efforts, even if programs are not expected to save money immediately. These case studies and published reports document with evidence and data what most of us already know: Wellness programs that have strong leadership support produce positive wellness outcomes. Case studies and published reports provide evidence that leadership modeling shapes employee behavior. There is no question that wellness programs with strong leadership support produce positive wellness outcomes. The hard part is helping leaders see that a healthy workforce is good for business and so they provide meaningful support. So what can brokers, wellness professionals, and managers do to help leaders cultivate support for workplace wellness? Over the years, WellSteps has struggled with this question as well. Below is the best list of strategies that we have found anywhere. 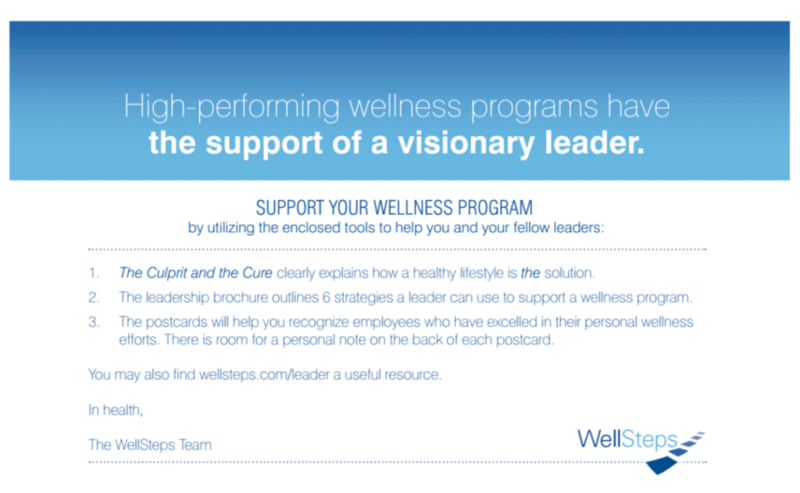 In 2015, WellSteps studied the qualities of the leaders that had the best wellness programs in our book of business. Specifically, we were interested in those companies with the best 2, 3, 4, and 5 year outcomes. We boiled these strategies down to the very best and included them in this info-graphic. Below is a more complete list of the 15 best strategies. If you want to see an even bigger list of strategies, go here. All of these strategies are intended to help leadership make small, meaningful steps toward supporting company wellness efforts. We share this information because we think that brokers and wellness professionals can help leaders apply these strategies. And when they do, the engagement in and impact of a company wellness program will dramatically improve. In lunchtime “CEO walks” or in community walks/ fun-runs, and share pictures! Using many of these same strategies, the leadership at Townsend Industries was able to create a culture of health and build an organization that employees love. Here is the story of how Townsend Industries used leadership support to create a best in class wellness program and at the same time kept employee turnover to less than 1% over a 10-year period. Some are not comfortable making suggestions to company leadership about how they can be a better leader, which is completely understandable. That’s why we also created a leadership support kit. 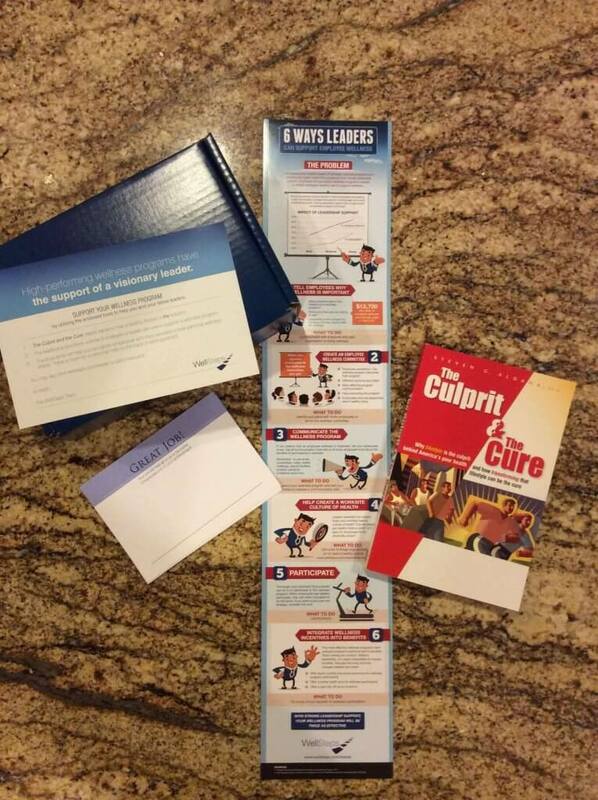 Pictured below, this gift box contains a printed copy of the leadership info-graphic, a cover letter suggesting how these ideas can be part of an effective business strategy, simple post cards that can be used to recognize employees who have excelled in their personal wellness efforts, and a copy of the best-selling book, The Culprit and The Cure. No leader is going to be angry or offended with these sincere and professional materials. If nothing else, this kit will help start a conversation about what can be done to support the wellness program. This letter is sent to all senior leaders. Five common objections to employee wellness programs are addressed in the video below. Two of the concerns mentioned in the video were about the return on investment (ROI) of an employee wellness program and where to find the money to fund a wellness program. To estimate ROI, we suggest you use the WellSteps ROI Calculator here. It is based on every piece of published scientific evidence on the effectiveness of workplace wellness programs. To see all the references, just click on the “Science” tab on the lower left corner. To help employers find money to fund a wellness program, use the Wellness Budget Calculator here. This tool was designed to help brokers find money for wellness programs through a premium differential or simple benefits-design changes. The algorithm is based on national estimates from 12 different carriers. Leadership support for workplace wellness is a critical driver of program success especially when you start a wellness program. Published research and multiple case studies show how program outcomes are dramatically better when they have support from leaders. Use these strategies to help company leaders become more involved and engaged so that the wellness program will meet the goals of all stakeholders. We have found that actively supportive leadership from the get-go would be ideal but in those client groups who have not “started” in that way, it’s where we’re encouraging them to take next steps. We too, are seeing undeniably better outcomes in participation and health risks as identified by our health risk questionnaires, culture assessments and health screening biometrics. Leadership support and involvement is key.